Courtesy photos by David A. Lee. 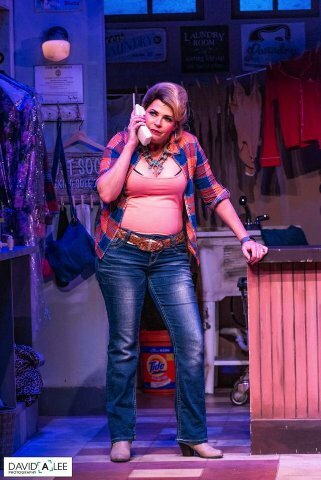 Coyote StageWorks of Palm Springs delivers an early Valentine to fans and lovers of Country Music with a country-western comedy romp and hoot called “Honky Tonk Laundry”, written and directed by prolific playwright Roger Bean. Country Western music celebrates the songs and stars of juke-box country music with a fresh, innovative, libretto that recalls how much sufferin’ goes on in ‘he/she did me wrong’ songs and lyrics along with the hilarious, everyday situations the characters find themselves in trying run a laundromat while at the time yearning to become performers in this play within a play production. Story-wise both ladies are just biding their time waiting to wreak revenge on the two men that done ‘em wrong; Lana Mae’s cheating husband Earl and Katie’s live-in boyfriend whom she booted out of her home for similar transgressions. This cleverly written and terrifically produced musical stars two gifted Equity performers: Bets Malone as Lana Mae Hopkins, owner and operator of the ‘Wishy Washy Washateria’, in Nashville Tennessee, and her one and only employee Katie Lane Murphy (Misty Cotton), who suffers from an almost incurable case of stage fright. (Remember, I said an ‘almost’ incurable case). As the age-old axiom says misery loves company, and these two actor/singer/dancer pros bond as two southern women trying to cope with love and marriage on that very bumpy road of life. It’s great stuff full of country musical comedy that the audience just laps up. 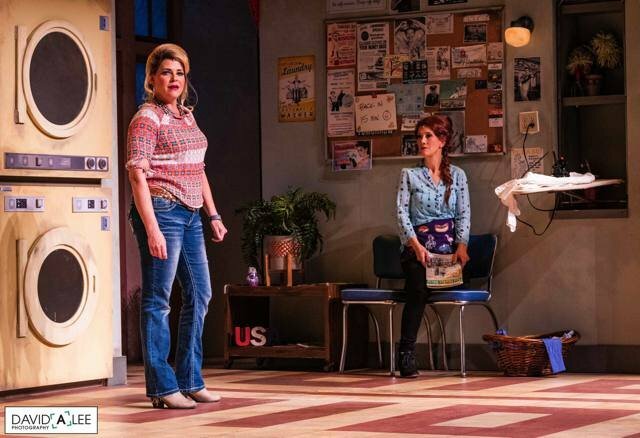 Ms. Malone and Ms. Cotton performed the same roles back in August of 2017 when they starred in the Los Angeles Hudson Theatre production of “Honky Tonk Laundry”. They were critically acclaimed star turns then, and they haven’t lost a beat in their reprisal transfer to the Palm Springs production currently performing at the Annenberg Theater. It’s still a tour de force effort by both easy-on-the-eyes talented ladies. In addition to the anthology music material and plotline, which at times, is rightly over the top, Ms. Bets, and Ms. Cotton perform like two peas in a pod with lots of two-part harmony and perform full bore, all out, and we the audience are the better for it. There are over twenty-four song titles and credit references in this interactive audience production that are featured in the show. There is one breakout number honoring three of country western music’s iconic performers of yesteryear: Loretta Lynn, Patsy Cline, and Tammy Wynette. Ms. Malone as Lana Mae Hopkins sings the signature songs pf Loretta Lynn and Tammy Wynette while Ms. Cotton sings as the great Patsy Cline. It’s a haunting musical moment that brings goose pimples to the audience amid a few misty eyes as well. This show is a poignant love letter to those who can’t get enough country western music from the greats who are now gone. (Speaking of show business greats; we lost Coachella Valley residents and National Treasures of the Arts Carol Channing and Kaye Ballard within the last three weeks) The on-stage energy generated by Ms. Cotton and Ms. Malone fairly crackles with foot-stomping, hand-clapping choreography by James Vasquez on a set creatively crafted by the acclaimed award-winning designer Tom Buderwitz. The music arrangements are under the baton of Jon Newton’s direction. The lighting design magic is provided by designer Moira Wilke Whitaker. The Costume designs by wardrobe Master Frank Cazares has the ladies outfitted in eye-catching, sparkling red, white and gold, glittering western-styled skirts and boots. The sound design and execution of the tracks by Sheridan Carnahan is smooth and spot-on. Director Bean leading his creative team can take bows for an impressive production that is stage managed by Dale Alan Cooke. 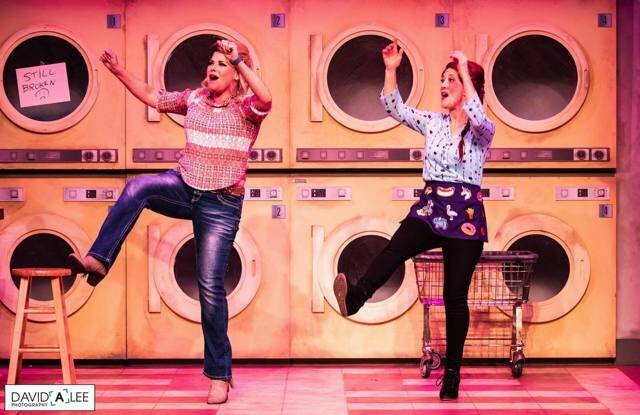 “Honky Tonk Laundry” is a splendid, fun-loving musical comedy that is being performed at the Annenberg Theater in Palm Springs and runs through February 10, 2019. For ticket information call the box office at 760-325-4490 or go online to annenbergtheater.org.